Easter is a cheerful holiday filled with pastel colors, cookouts and of course children hunting Easter eggs. 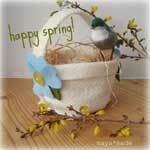 Easter welcomes in warm and wonderful spring time and the renewed growth of flowers, trees and grass. 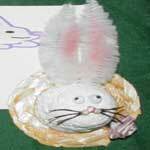 Creating Easter crafts with sewing patterns can be fun and rewarding. The whole family can get involved in making Easter egg ornaments that are so simple you can make several in a small amount of time. Or sew an adorable bunny hat that any little girl would love to wear. 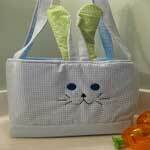 Make this an Easter to remember by making these items or others using the patterns listed below. 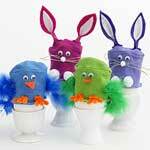 Using felt scraps and this Easter pattern you can make your little one an Easter bunny toy. Adorable Easter basket made completely out of fabric with a bunny face on the front, bunny ears on top and a little cotton tail on the back. 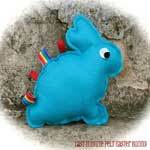 This is an adorable and fun to make rabbit coming out of a hat project. Just take some baby socks, white pom poms, tacky glue and a few other supplies and make adorable bunny and little chick egg cozies. 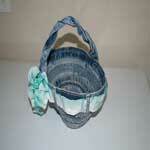 Here is a unique Easter basket made out of old blue jeans. Once finished, a ribbon is placed around the basket for a girl or leave it off for a boy. 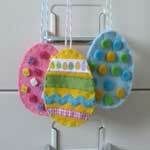 Cut egg shapes out of felt and add some colorful pastel decorations for cute Easter egg ornaments that can be hung most anywhere. 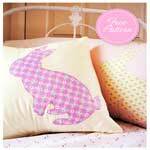 This is a square pillow with a bunny applique. 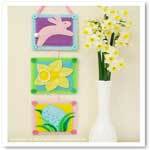 Great for adding bright and cheerful Easter decor to the bedroom or living area. 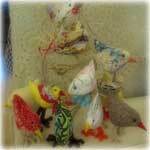 Easy to follow Easter pattern for making adorable little chickens. Have fun making several out of different fabrics and prints. Embroider this attractive wall hanging that has three squares attached to a wide ribbon for a burst of spring colors in your home. This precious little spring basket is made of felt with pastel flowers on each side. Makes a lovely decorative item you can display all season long.